An exotic type of 'hybrid' star has been discovered nearly 40 years since it was first theorized, but until now has been curiously difficult to find. In 1975, renowned astrophysicists Kip Thorne, of the California Institute of Technology (Caltech) in Pasadena, Calif., and Anna Żytkow, of the University of Cambridge, UK, assembled a theory on how a large dying star could swallow its neutron star binary partner, thus becoming a very rare type of stellar hybrid, nicknamed a Thorne-Żytkow object (or TŻO). The neutron star — a dense husk of degenerate matter that was once a massive star long since gone supernova — would spiral into the red supergiant's core, interrupting normal fusion processes. According to the Thorne-Żytkow theory, after the two objects have merged, an excess of the elements rubidium, lithium and molybdenum will be generated by the hybrid. So astronomers have been on the lookout for stars in our galaxy, which is thought to contain only a few dozen of these objects at any one time, with this specific chemical signature in their atmospheres. Now, according to Emily Levesque of the University of Colorado Boulder and her team, a bona fide TŻO has been discovered and their findings have been accepted for publication in the Monthly Notices of the Royal Astronomical Society Letters. "Studying these objects is exciting because it represents a completely new model of how stellar interiors can work," said Levesque. 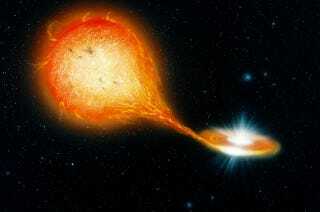 "In these interiors we also have a new way of producing heavy elements in our universe. You've heard that everything is made of 'star stuff' — inside these stars we might now have a new way to make some of it." In January, Discovery News reported on Levesque's work and the identification of several Thorne-Żytkow object candidates. Now, the team of astronomers have narrowed the selection down to a single red supergiant star in the Small Magellanic Cloud (called HV 2112) that has very similar chemical abundances and temperature to the Thorne-Żytkow model. The astronomers used the 6.5-meter Magellan Clay telescope on Las Campanas, in Chile, to record the starlight spectrum from HV 2112. "I am extremely happy that observational confirmation of our theoretical prediction has started to emerge," said Żytkow, who is also a co-investigator on this study. "Since Kip Thorne and I proposed our models of stars with neutron cores, people were not able to disprove our work. If theory is sound, experimental confirmation shows up sooner or later. So it was a matter of identification of a promising group of stars, getting telescope time and proceeding with the project." There are some subtle differences between the observational results and theory, but, as Levesque's team points out, stellar theory has advanced in the decades since Thorne and Żytkow's original work. "We could, of course, be wrong. There are some minor inconsistencies between some of the details of what we found and what theory predicts," said co-investigator Philip Massey, of Lowell Observatory in Flagstaff, Ariz. "But the theoretical predictions are quite old, and there have been a lot of improvements in the theory since then. Hopefully our discovery will spur additional work on the theoretical side now." Source: University of Colorado at Boulder, via Physorg.com.